• Mansa's, which is just down the road from HA LAM, is always open. However, make sure to catch them at lunch time when they are barbequing chicken and ribs. You can pick them up and take them home with you for a fabulous, easy lunch or dinner. 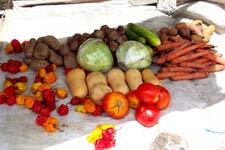 They also have the best lettuce, tomatoes, papaya, bananas and onions on the island. • Stop at Wendy's Deli for prepared potato salad, rotis and coleslaw. This deli is also a must for dessert lovers. • For the basics we went to Superfoods, just past Charlestown and Sunshine Shoppers near the airport. The only fresh orange juice you will find is Tropicana at Sunshine Shoppers. • For liquor, go into Charlestown or pick up duty-free before you arrive. If you want good wine, order a couple bottles at lunch or dinner and take it home. You can't find good wine anywhere else! • Golden Rock Plantation – great lobster sandwiches and grilled red snapper. • Chevy's Bar, next to Sunshines on Pinneys Beach – we had spicy fish sandwiches with fries, salad and 2 knock-out rum punches. 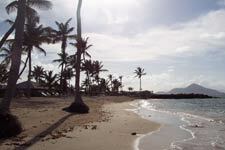 • Coconuts Wine Bar and Restaurant, near Oualie Beach – we had shrimp kabobs, Cote de Provence Rose and very Zen music. • Nesbit Plantation – we had breakfast here and enjoyed the banana and mango pancakes. • The Gallipot, located just before the airport - we saw their sign go up for fresh lobster and turned in and made dinner reservations that very moment for the evening! Lobster cakes came first, then the lobster itself (which was huge), served with fries and a salad! We had 2 bottles of Rose and no room for dessert. This was our big splurge for dinner. Our tab was about $ 260.00 for the 2 of us, but well worth it! Dinning out is quiet expensive so we were careful and actually enjoyed eating the great Caribbean fare. You just have to love rotis!! The weather was very balmy and there were on and off rain showers every day, but plenty of sun for those that can take it. Our favorite beach was Nesbit. There is a nice parking area for non-guests who would like to use this beach. The swimming is not great, but there is a constant breeze here so you are always comfortable even at high noon. The island was very quiet and not much coming and going. It was perfect! And the very best part? No Mosquitoes! Well, just a few. I think in the entire week, I received 6 bites. What more could you possibly want?